Today we had an early start leaving the hotel at 9:00 to catch a bus to the Metro station where we went on two different Metro trains. 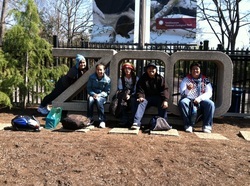 Our first stop was at the Smithsonian's National Zoo. We walked around almost 2 miles looking at various animals from around the world. There were llamas, turtles, lions, tigers, pandas, red panda and orangutans. After an hour we took the Metro to the Arlington Cemetery. In the Arlington Cemetery we saw thousands of grave stones, the eternal flame at JFK's gravesite, and the Tomb of the Unknowns where several guards take hourly shifts. Then we took the Metro to the Pentagon City mall for lunch and did some shopping. It was the biggest mall we ever saw. Our legs were very sore after the long walks. Our last journey for the day was at the Iwo Jima memorial. Orangutans climb over our heads on their own ropes course.